Brazil's acting president committed to "restoring confidence"
BRASILIA, Brazil -- Brazil's suspended President Dilma Rousseff vowed Thursday to use "all legal means" to fight permanent ouster in an impeachment trial, raising the specter of continued political turmoil as interim leader Michel Temer tries to rescue a sinking economy. Speaking hours after the Senate voted to impeach her, in what might prove her last official event within the presidential palace, the nation's first female president blasted the process as "fraudulent" and said it was an injustice more painful than the torture she endured under a past military dictatorship. Can Brazil overcome crises before Summer Olympics? She again rejected critics' accusation that she had used illegal accounting tricks in managing the federal budget. "I may have committed errors but I never committed crimes," Rousseff said during a 14-minute address, flanked by dozens of top officials and brass from her left-leaning Workers' Party. The Senate's decision came after a months-long battle that laid bare the country's fury over corruption and economic decay just months before it hosts the Summer Olympics. Speaking to several thousand supporters as she left the Planalto presidential palace, Rousseff said the accusations are nothing more than a red herring, part of a "coup" orchestrated by her power-hungry foes. "I am the victim of a great injustice," she said, adding, "I fought my whole life and I'm going to keep fighting." In his first words to Brazilians as acting president, Michel Temer said his priority will be reviving Latin America's largest economy. The vice president took on the duties of Brazil's president Thursday, saying he was committed to "restoring confidence." 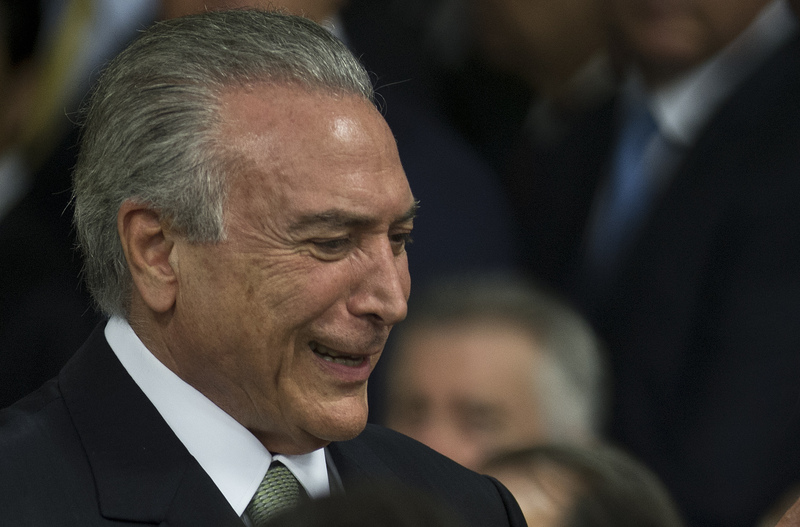 The 75-year-old Temer said he wanted his first public appearance as acting president to be a somber and discrete ceremony to "be in line with the times we are living." Rousseff has repeatedly said she would fight, but hasn't said how and most avenues have already been closed off. Up until now, the Supreme Federal Tribunal, the country's highest court, has declined to weigh in on the merits of the case against her. The Senate has 180 days to conduct a trial and decide whether Rousseff should be permanently removed from office -- in which case Temer would serve out the remainder of her term, which ends in December 2018. Some of her supporters have promised a campaign of protests and strikes that could complicate the efforts of interim President Temer to govern. Impeachment supporters contend Temer, a career politician and constitutional expert who has published a collection of poetry, is the best hope for reversing Brazil's economic collapse. Temer has promised to cut spending and privatize many sectors controlled by the state. Still, he has repeatedly denied Rousseff's allegations he intends to dismantle the popular social programs that helped the Workers' Party lift an estimated 35 million people out of grinding poverty during its 13 years in power. As Rousseff's impeachment looked increasingly inevitable, Temer began quietly putting together a new Cabinet. Its uncontested star is soon-to-be Finance Minister Henrique Meirelles, the former head of Brazil's central bank. The markets reacted positively to news of Rousseff's impeachment and the Brazilian currency, the real -- which has fallen precipitously against the dollar over the past year -- continued its recent rebound. When the impeachment measure was introduced last year in Congress, it was generally viewed as a longshot. As late as February, experts were predicting it wouldn't even make it out of committee in the lower Chamber of Deputies. But its champion, former House Speaker Eduardo Cunha, outmaneuvered the government at every turn, and the process built momentum with each of Cunha's successful maneuvers. Rousseff contends that Cunha, who was suspended last week over allegations of corruption and obstruction of justice, used the impeachment to wreak revenge on her. But analysts say that Rousseff's lack of skill as a politician and Brazil's tanking economy played major roles in her undoing. The Brazilian economy is expected to contract nearly four percent after an equally dismal 2015 and inflation and unemployment are hovering around 10 percent, underscoring a sharp decline after the South American giant enjoyed stellar growth for more than a decade. Making matters worse for Rousseff, a massive graft scheme at Brazil's state-run Petrobras oil company revealed deep-seated corruption that cut across the political spectrum, ensnaring top officials from the Workers' Party and the opposition alike, as well as some of the country's top businessmen. "Dilma is a bad president and waiting until 2018 was a horrible option," said cab driver Alessandro Novais in Rio de Janeiro, minutes after the vote. "I don't think Temer will be much better, but at least we can try something different to overcome the crisis." While polls have shown a majority of Brazilians support impeaching Rousseff, though they also suggest the public is wary about those in the line to take her place. Temer has been implicated in the Petrobras corruption scheme, as has Renan Calheiros, the Senate head who is now No. 2 in the line of succession. Rousseff has vehemently denied her administration's budget moves constituted a crime and argued that such maneuvers were used by prior presidents without repercussions. She has stressed that, unlike many of those who have pushed for impeachment, she does not face any allegations of personal corruption. In her parting words at the presidential palace, Rousseff evoked her travails under the 1964-1985 military dictatorship, when she was imprisoned. She said that neither the pain she was subjected to by the regime's torturers, nor the suffering she would later survive as a cancer patient, compare to the feeling at being what she regards as unjustly removed from office. "It's the most brutal thing that can happen to a human being to be condemned for a crime you didn't commit. There is no more devastating injustice," she said before leaving the palace, perhaps for the last time.